Vista Professional Outdoor Lighting launched the LCS WiFi Lighting Control System, a low-profile, lightweight, cloud-based, multi-zone WiFi lighting controller. A free, downloadable app allows users to manage the controller from their mobile devices regardless of location. Designed to control 150 watts of lighting in three individual circuits or zones, Vista’s LCS can be used with nearly all low-voltage power systems available on the market today, and it can also be retrofitted to work with previously installed low-voltage outdoor lighting systems. The controller has LED indicator lights that show when power is on or off, as well as the current brightness intensity of each of the three zones. After downloading the free mobile app available from the App Store or Google Play, a single user can control multiple LCS units. An external antenna makes it possible to connect to WiFi from greater distances. 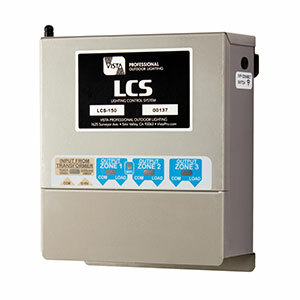 Installing the LCS does not require its own 120-volt input but instead receives power from the host transformer. With waterproof NEMA 3 stainless-steel housing, the controller can be mounted on a wall or pedestal. Vista’s own unique “cable raceway” feature offers a drop-down tray for quick, easy access to the LCS’s wiring compartment.